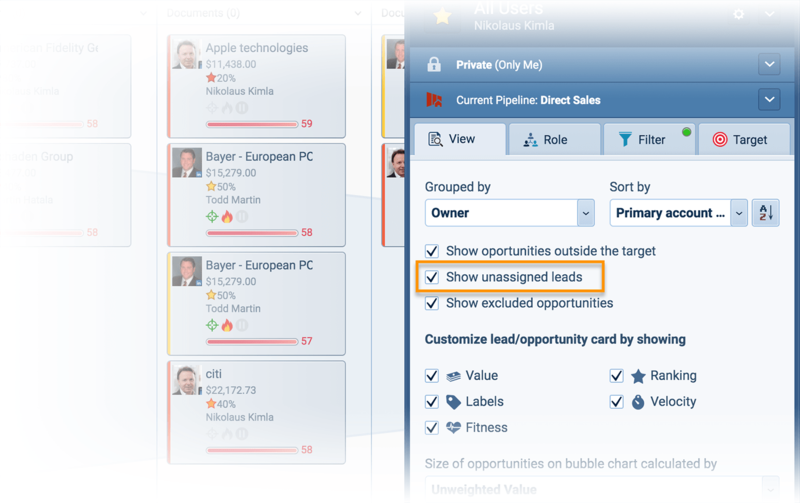 How to use Power Panel options to create views of Pipeline that help manage one-on-one or group meeting with teams. 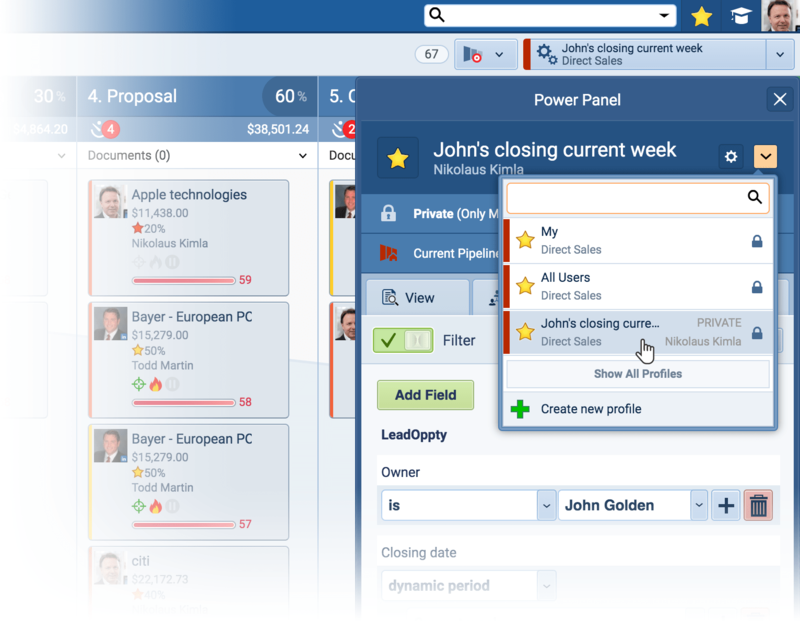 In addition to providing information on how to utilize the Power Panel to obtain the information for your meetings with your sales team, we will also demonstrate some of these concepts with the following scenarios (see their corresponding videos). 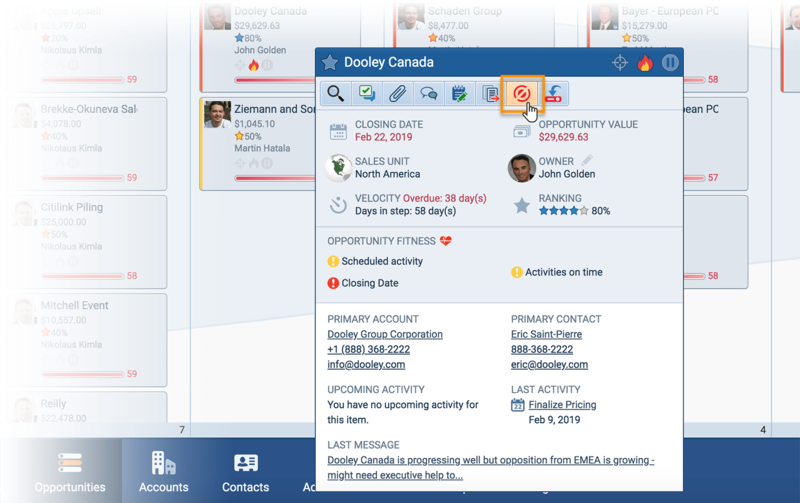 Joe is having a meeting with his sales team and want to ensure that he has immediate visibility of how well the Opportunities are moving through the sales process and discuss some strategy with his staff. 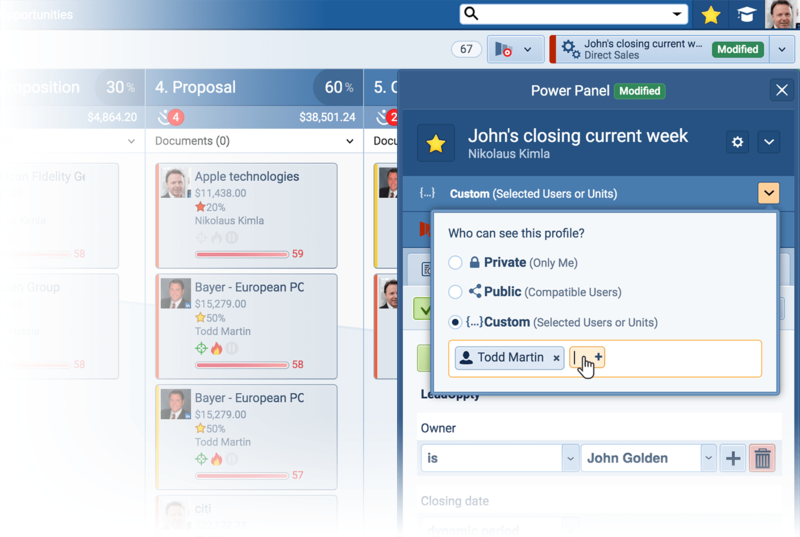 Joe will use the power panel in the Pipeline View to turn on the velocity. Joe is having a one-on-one meeting with Sally, a member of his sales team. He wants to ensure that Sally’s Opportunities are being worked on. Joe turns on fitness and filters to only see Sally’s Opportunities to visually see the health of her Opportunities in preparation for the discussion. Joe in interested in viewing the deals that are expected to close this week. He needs to report this information to his superior. In addition, he has a suspicion that there may be some deals in the Pipe that are past their closing dates. 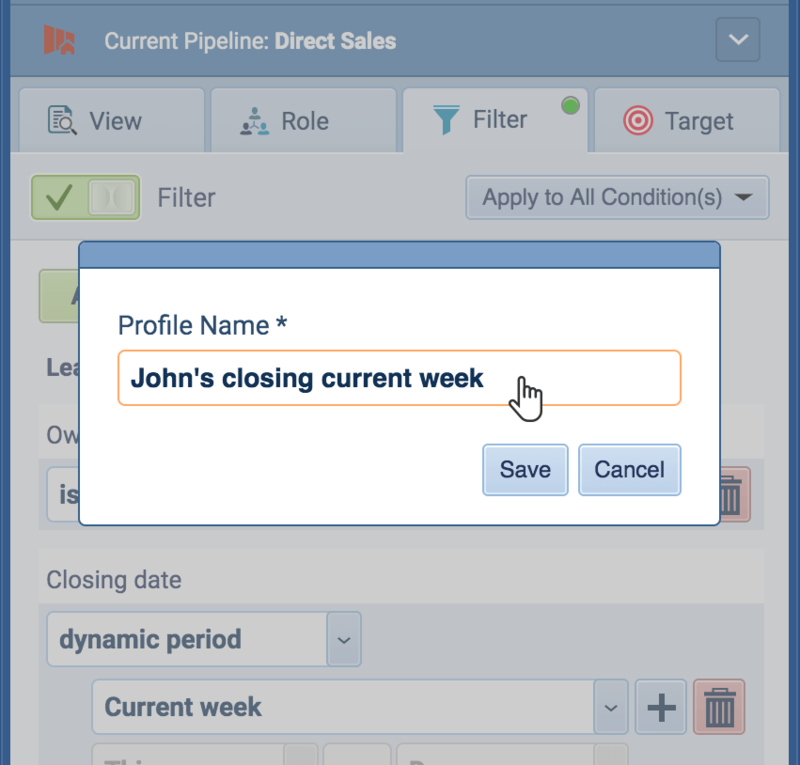 Joe will use the Custom Filter to narrow his view to only closing dates of this week. 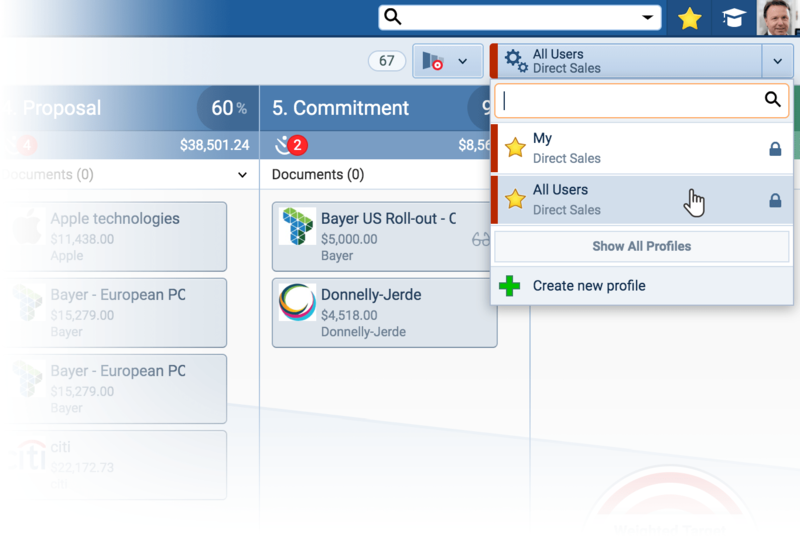 Then create a report with one click on that data. The "My" View (Profile) — this profile view is pre-filtered to show you records where you are the owner or have been added as an editor or a watcher. The "All Users" (Profile) — this profile view shows you all the records that you have rights to see. These rights are assigned to you by your Pipeliner Administrator. 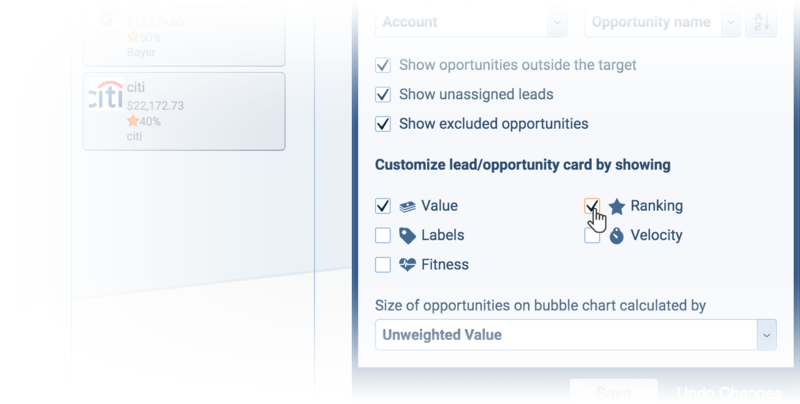 Quickly modify your options to show you additional information on each card, organize the opportunities in the Pipeline, or exclude or include seeing opportunities, or those that are outside of your target range. 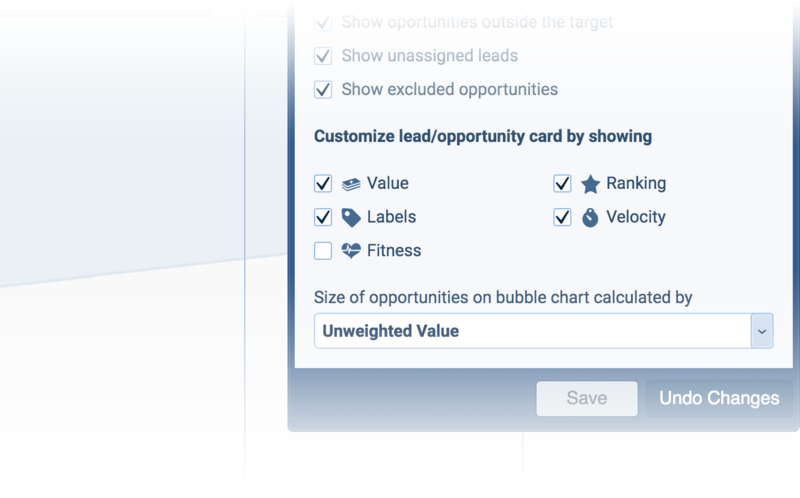 Use the "Velocity" checkbox to see the length of time each Opportunity has been in its current step of the sales process. If the display is in Red it is beyond the number of days it was expected to stay in that step. NOTE: The velocity can be modified for each step of the process by your Pipeliner Administrator. 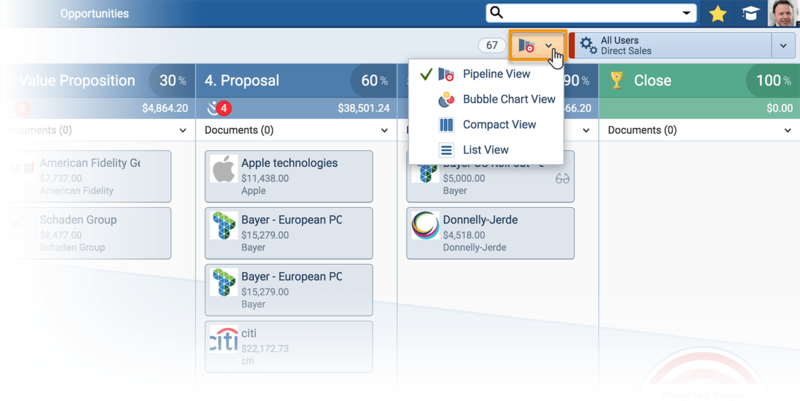 Click on "Save" to ensure that Pipeliner will remember your selections for the next time you select this profile when using the "Pipeline" View. Grouping them by "Owner" will visibly display the pics of the owners (if they had added their pic in their user profile). 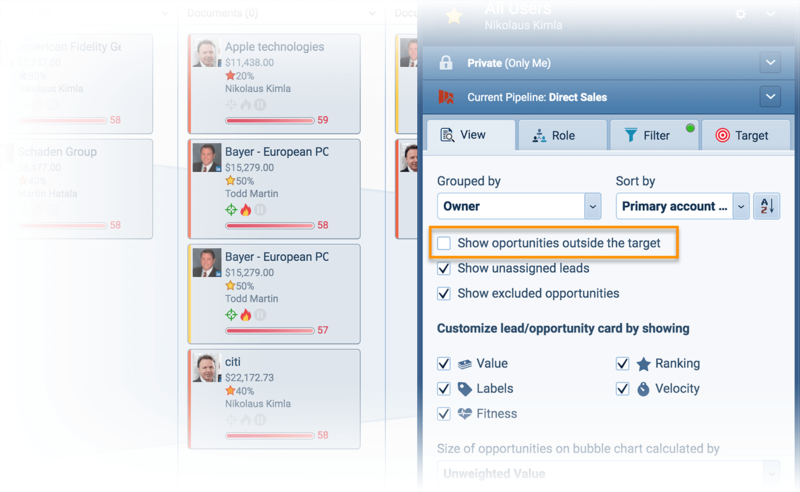 Also in the "View" Tab is the ability to Sort the Opportunity Cards (the drop-down list will be dependant on how your company had configured Pipeliner). 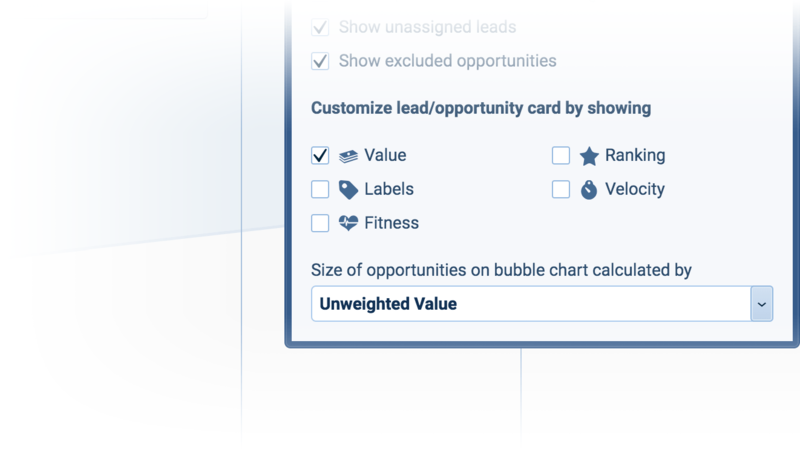 In the "View" Tab you can select options to view Opportunities that are outside of your currently selected Target criteria. 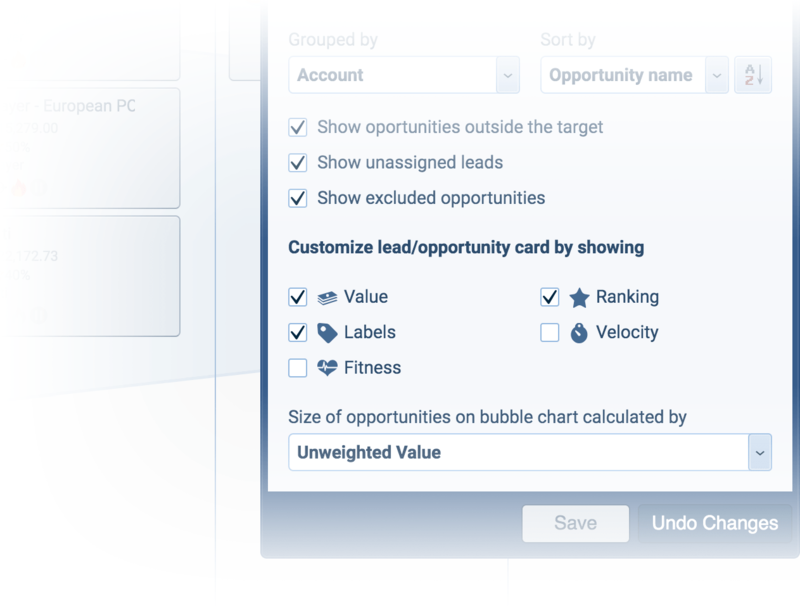 Read more about Target Criteria and Settings in this article. 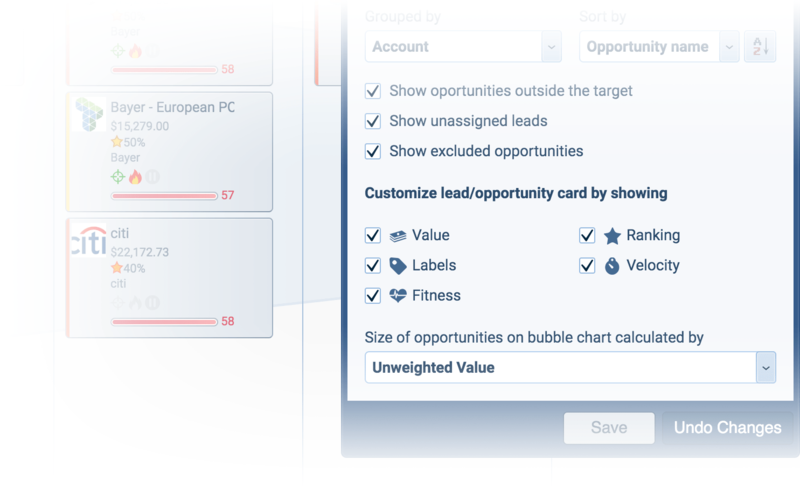 Users can also manually exclude Opportunities from the Target. 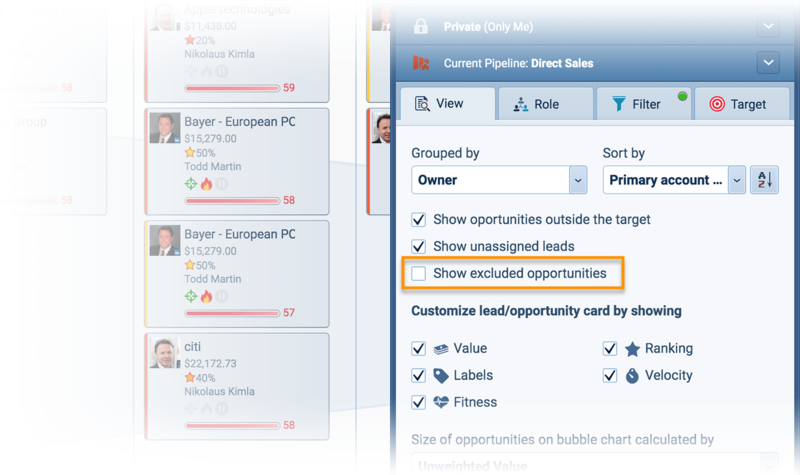 EXAMPLE: As a manager of a team, you might not want the entire team to immediately see certain opportunities in your team meeting where you will be showing the Pipeline view to everyone; or maybe one of your sales reps tells you that there’s a deal that is alive but marginal and you don’t want it to skew the Target figures. 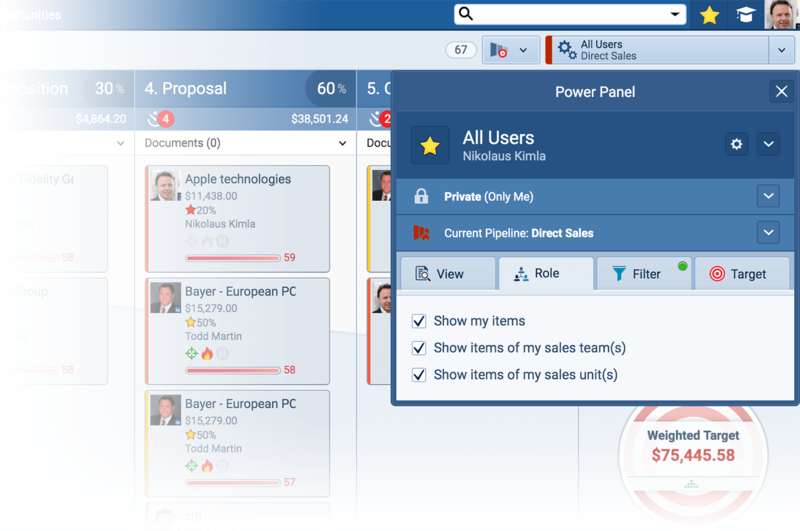 Select the "Filter" Tab from the Power Panel and click on the toggle to enable filtering. Notice you are in the Preset Filter area by default. This button is on the bottom of the page. 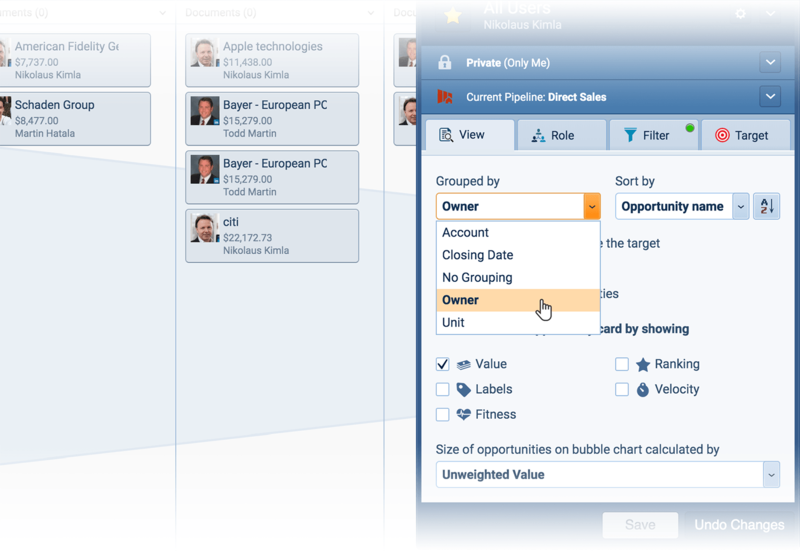 In this example we will Filter on a specific Owner. 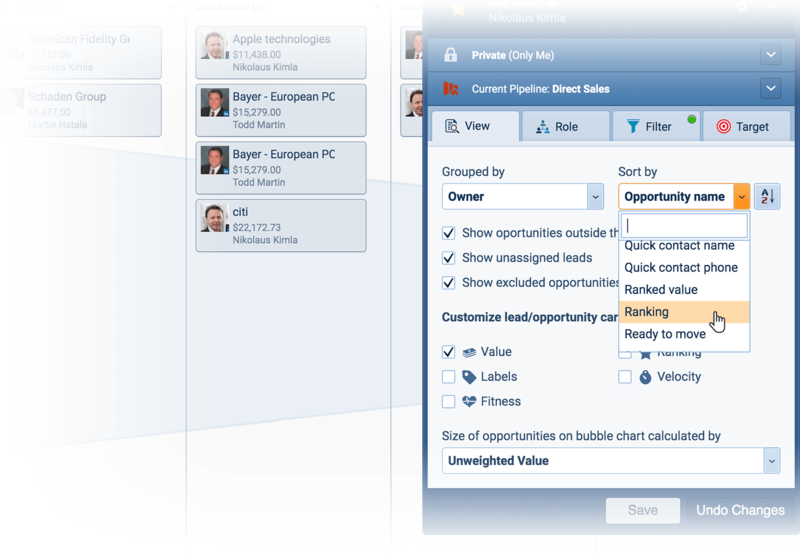 Use the Owner field’s drop-down list to select the person whose Opportunities you want to see. 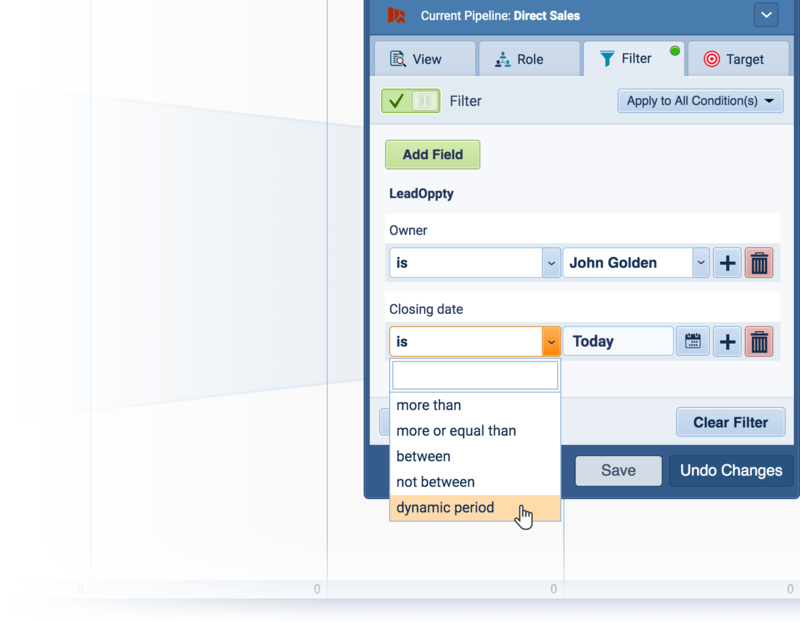 Custom Filters allow you to create filters using any field that you can access from your current area of Pipeliner. 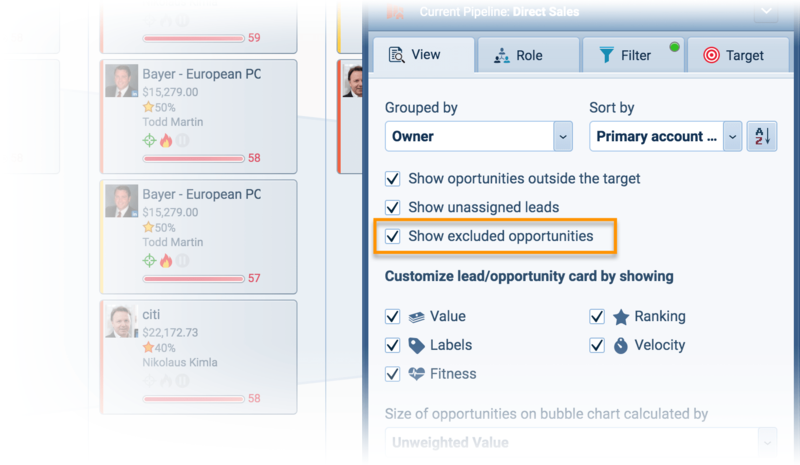 If you do not see the field you need to use to filter on in the Preset Screen, or if you want to filter on more than one custom criteria, you need to click on the Custom button. 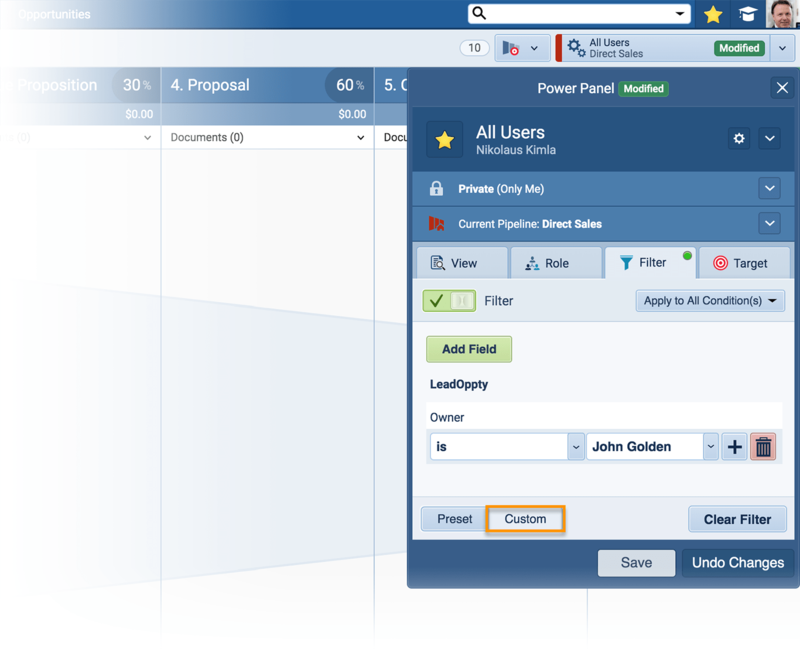 From the "Filter" Tab, select the "Custom Filter" button on the bottom of the Power Panel. 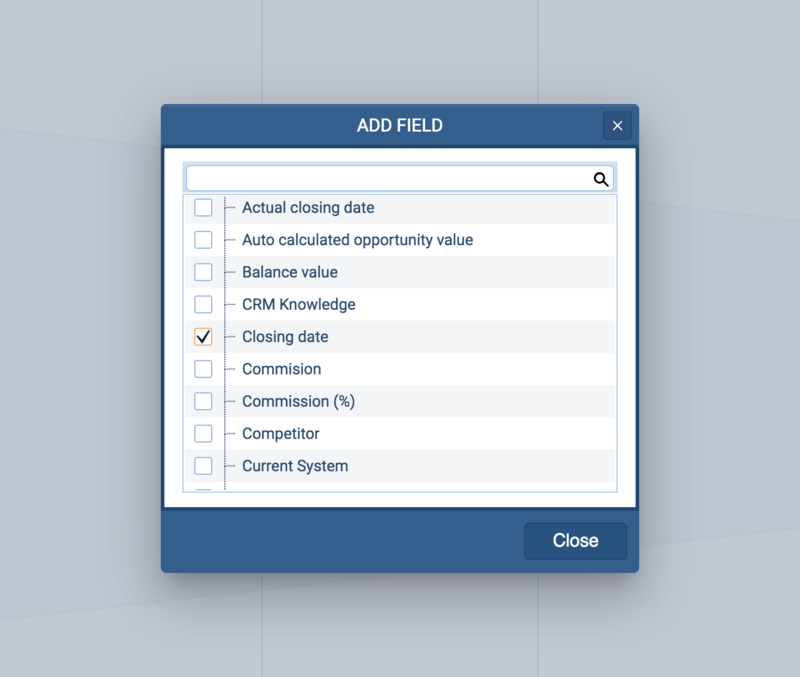 Click the "Add Field" Button to add additional field(s) you want to filter on. Use the search tool at the top to help find the field. 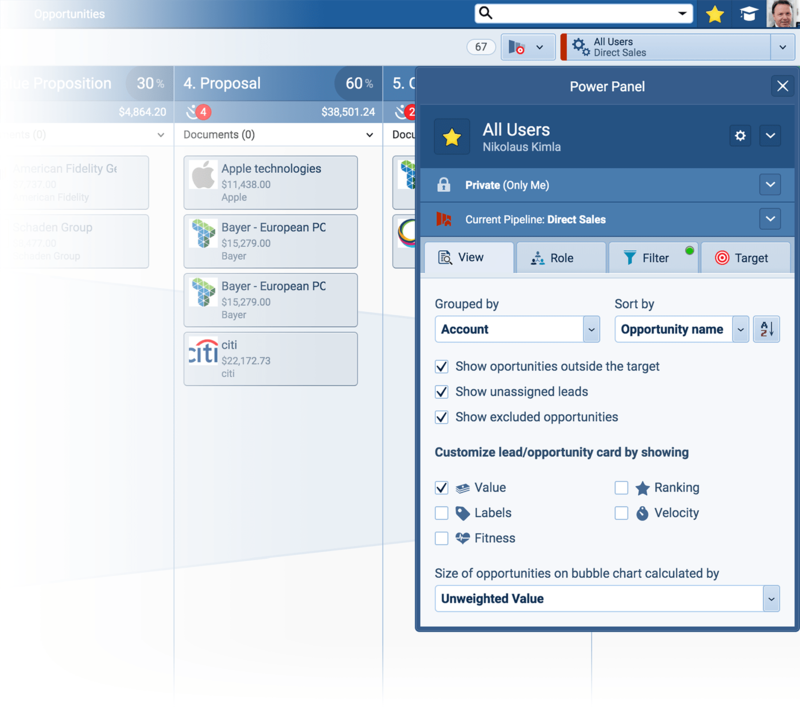 In this example we are using the Closing Dates of the Opportunities. In this example, I’m seeking Opportunity closing dates of this week. 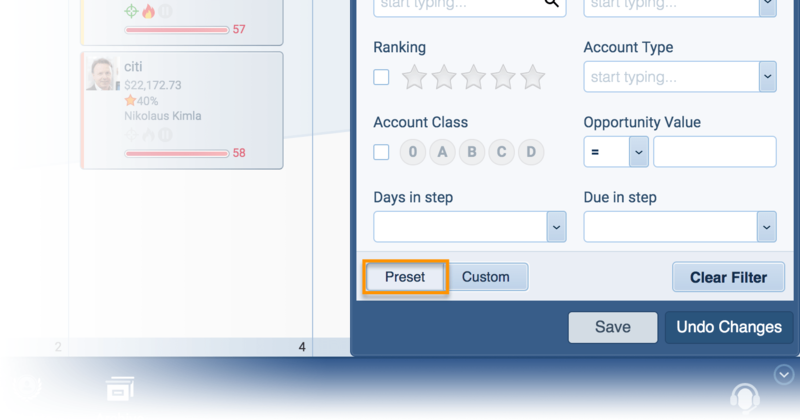 Select the drop-down under the field name. Select "dynamic period" from drop-down. NOTE: Dynamic Period will always be changing to that current period that you choose. That means that if you select the dynamic period of Current week. 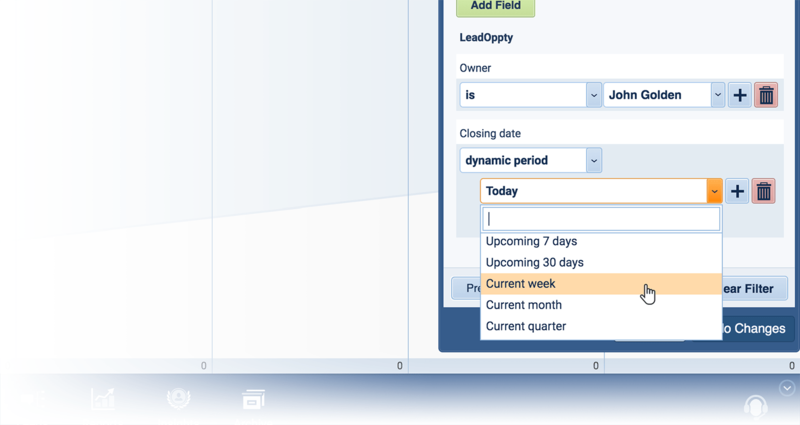 Next week it will display that week’s things, without having to modify this field. You can now save all your selections from the View, Role and Filter tab as a custom profile so you can access it whenever you need to. Select the "Cog Wheel" icon next to the name of the current profile in the upper right of the Power Panel. In this way the original Profile View is not modified and still remains intact as it was prior to you modifying any of the tabs in the Power Panel. 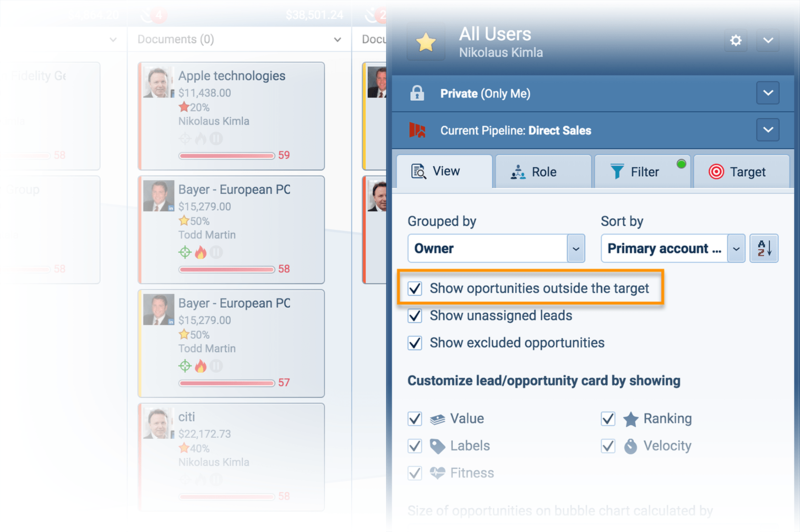 Custom — select which Pipeliner users you would like to be able to see the same Profile as you. 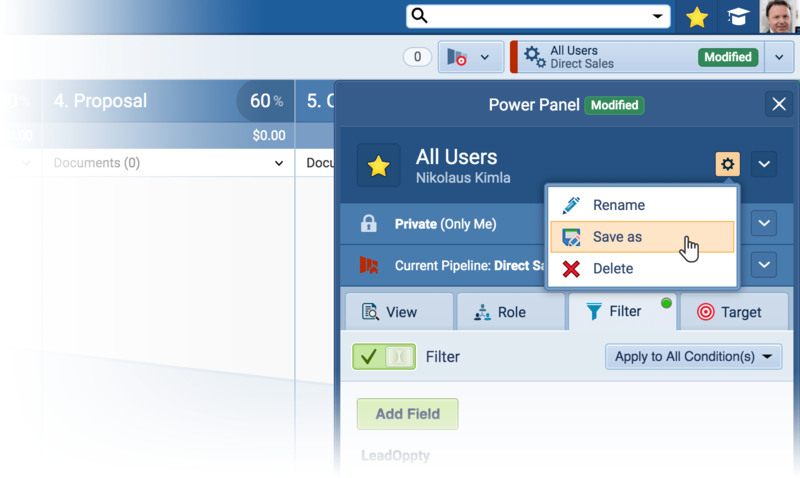 NOTE: any of the above will only be able to be seen if the user has the rights to see it based on their User Role in Pipeliner that is managed by your Administrator.